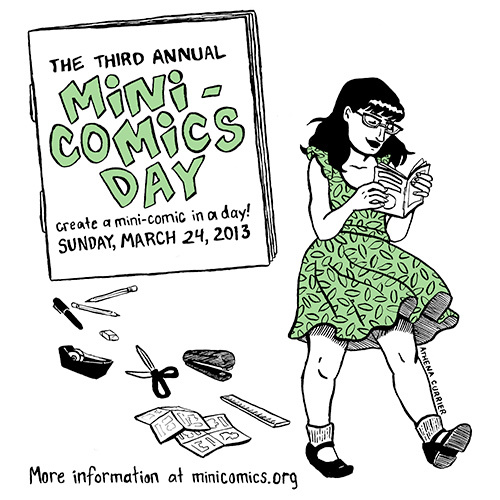 Mark Your Calendars: Participate in Mini-Comics Day 2013 on March 24th! March 24th, 2013 is the date for the third annual Mini-Comics Day, celebrating the art of cartooning and creating hand-made comic books (the first event was held April 9th, 2011). Guidelines: To participate, create a mini-comic from start to finish on March 24th, 2013 (including writing, drawing and printing it). You can make your mini-comic by yourself or with other artists. When was this decided? I’d been looking out for mini-comic day 2013 but I only found out about it the day after it happened! I just might declare my own… is there a mailing list I can get on? Sorry you missed the day, Colin! There is no mailing list, just this blog. You can definitely still participate on whatever day works for you. I’ll set up an account for you on the Mini-Comics Day blog so you can post whatever you want. Thanks much for participating! I enjoyed your 2012 comic.